There are many ways to shorten antennas. Before choosing how we must first state why we are doing it. Without a clear purpose to the exercise there can be no clear approach to take. My own reasons are, for the low HF bands, to lower the visual impact and reduce the engineering challenge while still achieving DX performance similar to a full-sized antenna. Keep in mind that any length conductor can be an antenna. What we usually mean by shortening is to design an antenna that is short but still resonant on the selected frequency. A suitable matching network can match any conductor, though there are considerations of cost and losses due to attenuation within the matching system and due to high SWR on the transmission line. The match does not impact the antenna's efficiency or pattern, except if one is careless about keeping antenna currents confined to the radiating elements, not least of which is feed line radiation. If you are like too many hams of my acquaintance you may want to reread the previous paragraph. Mismatch does not affect the antenna pattern. However it can be very desirable to get the antenna's raw feed point impedance close to 50Ω in order to avoid having to design around those potential losses. That is one of my intentions in this exercise. Enough of that, time to design that 40 meter vertical dipole. The EZNEC model shown here is an approximately 13.7 meter tall aluminum mast mounted 3 meters above ground. It is symmetrically loaded with two 6 meter long wires (12 AWG, THHN) that are attached to the top and bottom, and parallel to the mast at a separation of 40 cm. I've mentioned it before but I'll do so again, that modeling closely-spaced conductors with NEC2 must be done carefully and I believe I've gotten it right. Even so some difference between the model and reality is expected. There are other ways to deploy the loading elements to further shorten the antenna or to change its impedance. My choice was a compromise between getting it tall enough to place the current maximum (the broad middle of the antenna as the current plot shows, about 10 meters above ground) as high as possible without making the antenna too visible or requiring excessive engineering. Many commercial designs also employ small loading coils to reduce the length, but this lowers the current height and, perhaps, 1 db of loss. As it is the antenna has -5.45 db of losses that are almost entirely due to near field and far field vertical-polarization losses, with negligible conductor losses. There are no matching system losses since I have tuned it to near perfect 1:1 SWR at resonance. You can also see from the SWR chart that no additional matching is required over the entire 40 meter band, though if that is your aim you ought to resonate it a little higher than I have. You can see I do have a CW bias. To get that SWR I moved the feed point (EZNEC source) along the mast until I found the spot I wanted. 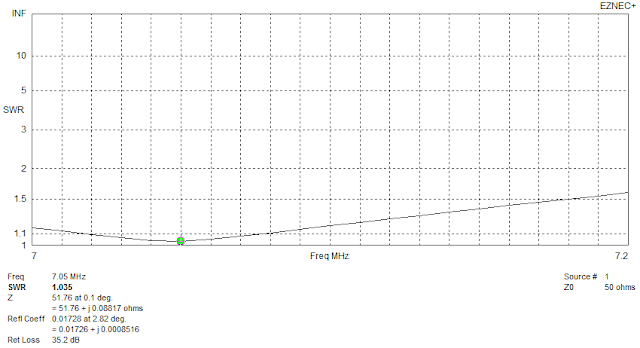 This is 15% (2 meters) from the bottom where Z=55Ω at 7.05 MHz. Doing this does not affect either the current distribution or the antenna pattern. The choice is a trade-off between feed line match, antenna construction and feed point accessibility. The rationale at work here is simply one of Z=E/I (Ohm's Law for AC) where the product of E and I is constant, P=EI, for cases, like this one, where conductor losses are negligible. To get a higher Z value, move the source to where the current is lower; do the opposite to get a lower Z. At resonance (Z = R + j0) and no conductor losses Z is simply the radiation resistance. 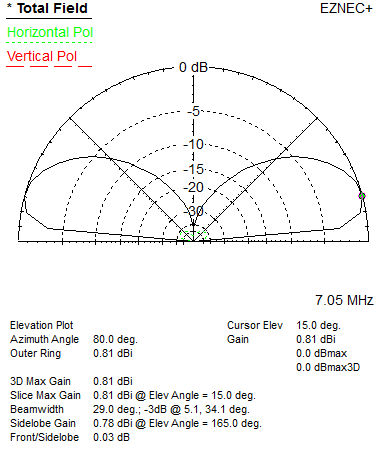 When fed at the centre of the mast Z=50Ω (resonance @ 7.03 MHz) and at the bottom Z=72Ω (resonance @ 7.11 MHz). Since there are environmental factors at play (ground, houses, etc.) construction should allow for some adjustment of impedance matching and tuning for resonance. Breaking the mast with a dielectric spacer will work but does not allow for adjustment and may reduce the structure's strength. It may be better to use a stub match or just let the rig's antenna tuner (if you have one) make the small adjustment. I am undecided on which way to go should I choose to build this antenna. Perhaps the easiest way to adjust the resonant frequency is to make the bottom "wire" a solid aluminum rod and slide the attachment point of the vertical loading element. This seems to work well over a range of 100 kHz, at least according to the model. Getting back to the pattern of this antenna, an elevation view is shown here. You can see the affect of ground losses on the antenna's gain and low-angle performance. While that loss of 1 S-unit may seem excessive, what matters is the comparison to alternatives. For example, a dipole up 10 meters has little in the way of ground losses but at the same elevation of 15° where the vertical peaks the dipole's gain is -0.6 dbi. Most of the dipole's radiation is at high elevation angles. To beat this vertical at 15° the dipole would have to be up at least 14 meters. That would require two support structures or at least a tower to support an aluminum-tubing dipole. It would also be directional. However as an interted-vee on a 15 meter tall mast it would be almost as good and also more omnidirectional than the dipole. That's a useful comparison since the vertical dipole could instead be used to support an inverted-vee. I'll come back to this later.